I was never that into the game of tag as a kid. I hated being “it” and there always seemed to be an element of social aggression in that and many other playground games. My daughter must be a chip off the old block, since she doesn’t like these sorts of games either, and in fact often decides to opt out of playing them. So, thank you to Aerie-el from Gardener’s Roost for inviting me to join in the game of “Photo Tag.” The rules are to go to the 4th folder in your computer where you store your pictures, select the 4th picture in that folder, explain the picture, then tag four people to do the same. My digital photos are stored in alphabetically-ordered folders and are a big bone of contention in my household – there are way too many of them on the poor old computer and it’s getting very slow and sad as a result. Sorting through and archiving them is a big project for a quiet day that never seems to happen. I wonder if anyone else is in the same boat here? Digital cameras make it so easy to accumulate a frighteningly large number of images – I need to be more ruthless with my deletions but so far I’m not doing too well. The 4th folder in my picture files is from October of 2006, when my folks made a long-anticipated trip to Italy and France and we went over to their place to do a few house and yard chores while they were away (kind of a miracle, given than the help almost always flows the other direction!). One of the things they asked us to do was to pick up and sort by variety the windfall apples that had accumulated since their departure. Our daughter, 3 1/2 years old at the time, got totally into the apple retrieval job – she was small enough to fit under the dwarf trees’ branches and could reach apples that were hard for the big people to get to. So, in the 4th photo of my “Apple Pick-up” folder, here she is all bundled up on a crisp fall day, about to go get another armload of fruit. As for the final rule of this game of tag, I am going to steal an idea from another commenter on Aerie-el’s site and not designate the next four folks. If you have read this far and would like to participate, please consider yourself tagged! 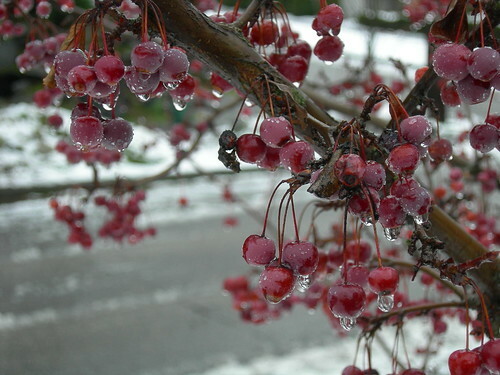 After yet another snowfall the other day, I spotted this parking strip crabapple and had to stop, slog through the slush, and take some photos. 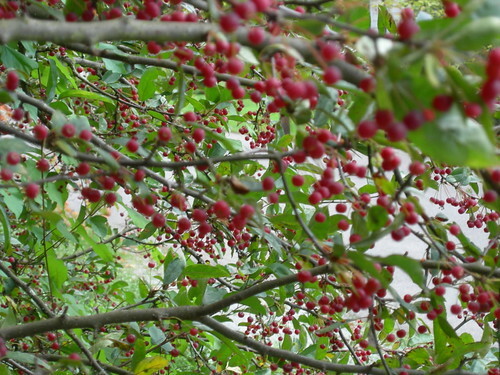 I have complained about my own crabapples, which are spindly and perhaps have been poorly pruned, but these ones had a nice shape and the color of their fruit is really pleasing. 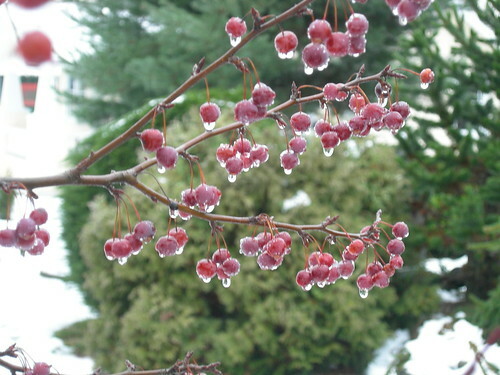 Plus, they looked pretty with the snow melting off of them. 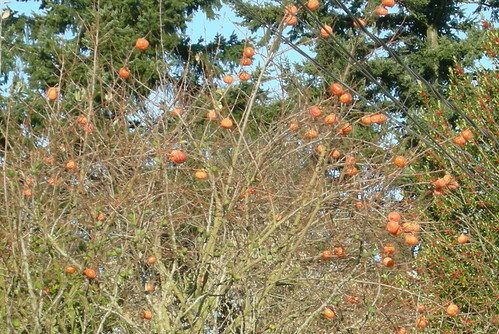 I’m not sure why the birds have left these alone – maybe they are too tart even for our avian friends? I know there are fans of crabapple jelly out there, it seems like kind of a green tomato thing to me but hey, whatever floats your culinary boat. Raintree Nursery has a lot of crabapple varieties. They can be used as ornamentals, for their fruit (usually for preserves), and also as pollinators for regular apple trees. Are you ever just driving or walking along when you see something so surprising it stops you in your tracks and you practically get whiplash from turning to look at it? That happened to me the other day. Snow had fallen on the ground, not a lot, not nearly as much as would eventually arrive, but a bit. I was heading back from the school run (they started two hours late, due to icy roads) when I had to stop the car, roll down the window despite the freezing temp, and take a pic. 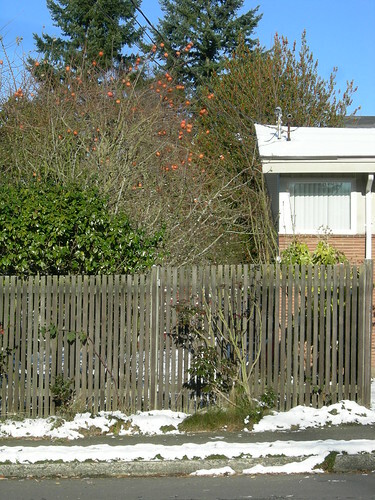 What the heck are those orange things up in the tree? I thought persimmons didn’t grow in Seattle?!?! Well, I didn’t know palm trees did either, but I was wrong there too. If you’re like me, you may find persimmons puzzling. Which one gets soft and can be used for baking (or frozen and turned into delicious “sorbet”, as I heard recently), and which is the one that stays firm and can be sliced and eaten raw? 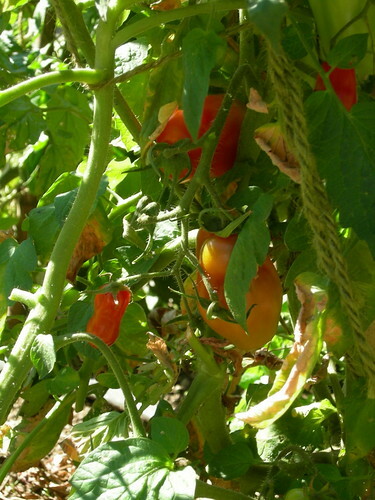 I don’t think I’ll ever get them straight, but for the record, Fuyus are the flat-bottomed ones that kind of look like round tomatoes – when slightly soft, peel, slice, and add them to salads. Hachiyas are the oblong ones, and they are super bitter unless completely, mushily ripe. My horticulture book says Hachiya persimmon trees can survive zones 7-10, but this looks like it might be a Fuyu and I can’t find the zone info on that – I just hope it makes it through our tough week-long spate of freezing temps and mucho snow. I certainly enjoyed stopping to admire its odd look, with those blazing Mars-like orbs marooned high atop the naked branches of the venerable tree. 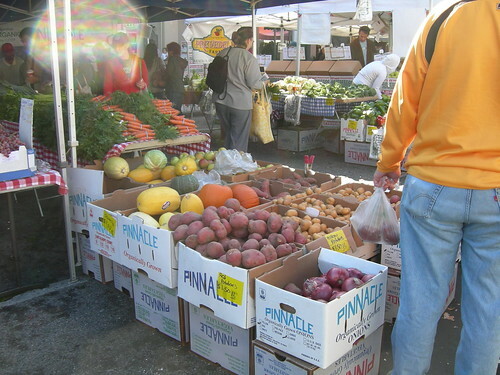 You know, I truly love Michael Pollan, but I always get a little annoyed when he talks about eating seasonally and locally, living as he does in Berkeley, CA. Easy for him to say! 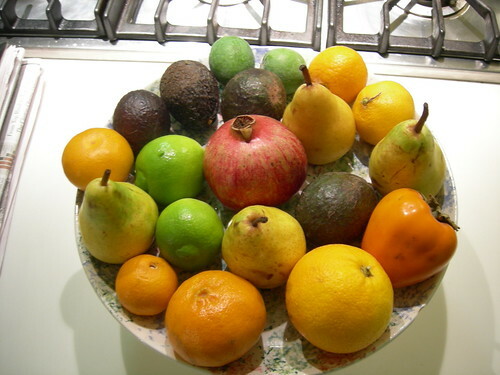 Here in Seattle, the locally grown stuff is waning fast to a winter pittance, and if all we ever ate was local produce, we would never taste even a bite of one avocado, banana, grapefruit, lemon, lime, orange, mango, papaya, etc etc and the list goes on. I’m not advocating against making good-for-the-planet choices and being mindful of where our food comes from. I just wonder if Mr. Pollan would be so quick to advocate for localvore-ness if he lived in, say, Manitoba. 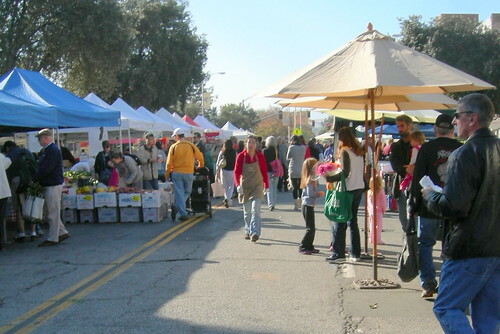 A recent visit to the California Avenue Farmers’ Market in Palo Alto proved illustrative of this point. Here we were, the Sunday before Thanksgiving, strolling around in the sun. It was in the 60sF, so a lot of people weren’t even wearing jackets. Palo Altans have not one, but two Markets to choose from when they wish to buy direct from producers. 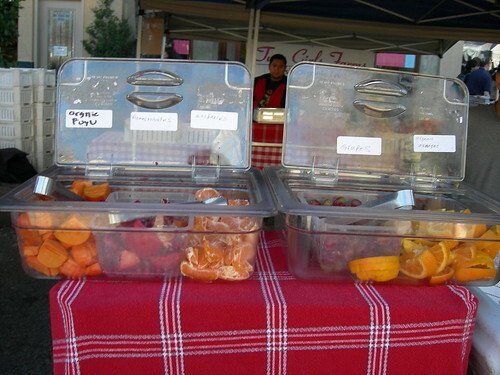 The other, on Saturdays in downtown Palo Alto, has been around longer (since 1981) and is therefore more established. They are run by different entities, not sure what’s up with that. We flew in on Saturday evening so we only had the Sunday market option. Here is just some of the goodness that was on offer. Root veggies and squash, pretty standard anywhere at this time of year. 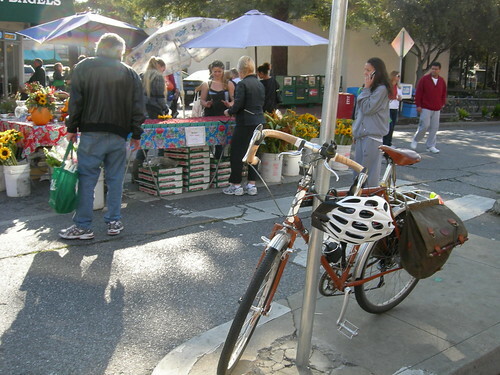 Biking to the market, also possible elsewhere depending on your climate and personal hardiness. But then things started to get a little more interesting. Fresh raspberries in late November, anyone? Pricey, but I had to have some to share with family and friends. Won’t have any again until next summer, so it was worth it. 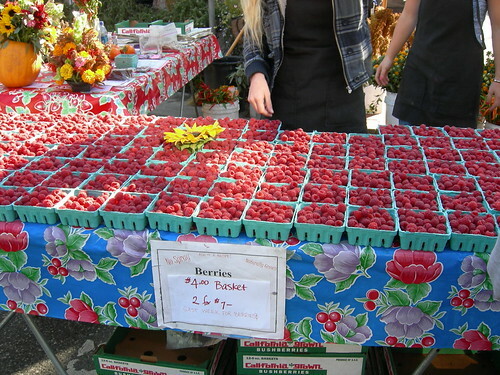 The raspberry ladies were also selling flowers. 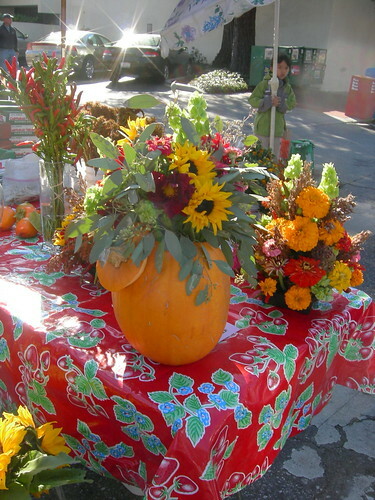 I loved their pumpkin vase, I’m going to have to remember to try this next year for a Halloween centerpiece. Organic lemons and limes for $2 a pound, now I was almost crying with joy. 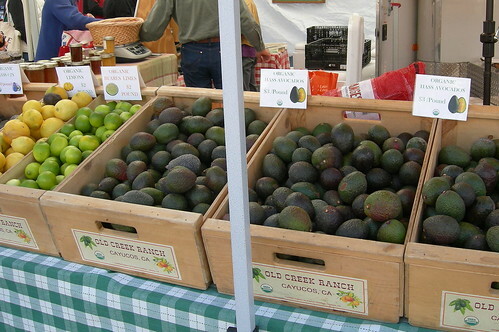 And right next to them, tiny little perfect Hass avocados. I bought some of everything and made guacamole. I wondered if the avocado pits would be proportionally large for the fruit, but they were tiny and perfect too. I should have saved one to sprout indoors back home. Pomegranates are almost at the top of my all-time favorite food list. They are $3/each for organic ones at my Seattle food co-op, so they are usually a once-a-year treat. 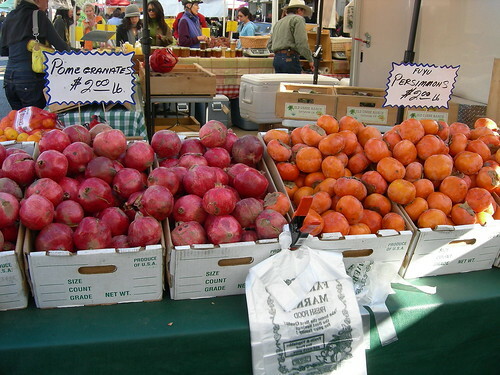 Here they were super cheap, ditto persimmons. Into my bag they went. My daughter is not big on tasting new things but even she had to agree that the Fuyu persimmons were tasty. There sure were a lot of options for sampling! Oh man, I forgot to mention the pineapple guavas. I’d never even heard of those, and I consider myself a foodie! 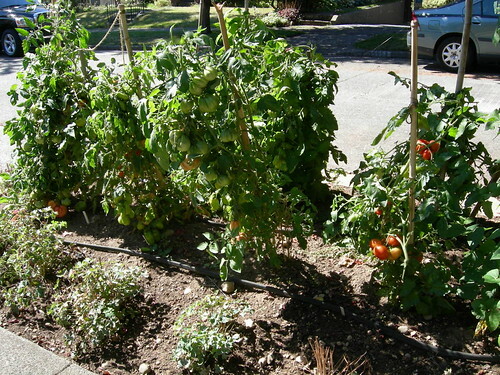 And yes, they were organic and grown locally. They tasted more like a flower than fruit, and are the little green lime-looking things at the top of the final photo, below. I’m definitely down with the eat-locally cause. I just know it would be a heck of a lot easier, and would have so much greater variety, if I still lived in California! 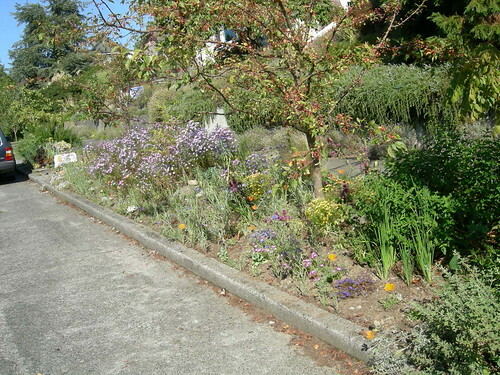 Some folks in my neighborhood have a wonderful garden which spills out onto the street and into their parking strip. All summer, I kept walking by it sans camera and had vowed to return and capture it in its full glory. Of course, the one time I remembered, the sunflowers had been downed by a recent windstorm and most of the blooming stuff had started winding down for the winter. 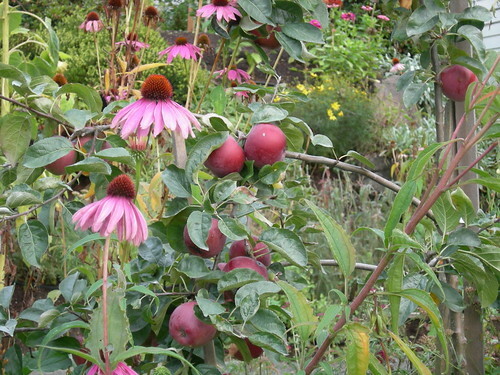 Still, they had a really impressive bed full of purple coneflowers (Echinacea purpurea) and a heavily-bearing apple tree, the fruit of which actually looked quite healthy. The purple coneflower’s genus “echino” is from the Greek word for hedgehog, apparently referring to the spiny/bumpy surface at the flower’s center. This US native’s flowers are often used in teas and herbal supplements and are thought by some to boost the immune system. 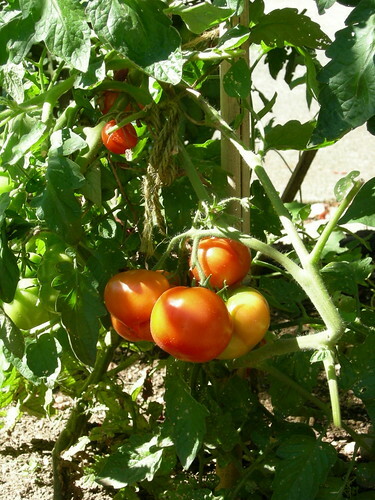 I haven’t had the greatest success in growing them, although they are supposed to be easy. 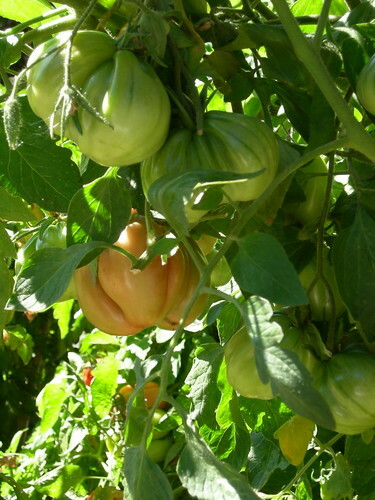 I tried a white variety once but probably had it in a bad spot, as it struggled. I get such a kick out of these sidewalk gardens, they provide so much enjoyment for anyone who bothers to notice as they pass by. I’m hoping that more and more folks decide to rip out their grass and try their hands at gardening at this very visible intersection of public and private space.